Fidelity Bank, our parent entity, opened for business in 1909 and now has over 60 branches throughout North Carolina and Virginia. We are deeply rooted in Fidelity Bank’s small town origins and values based on relationships, trust and fiscal responsibility. Fidelity Bank’s vision for over 100 years has been to be an Independent, Sound and Profitable bank that customers come to first and bank with for life. Fidelity Bank is privately owned, not for sale and not saddled with quarterly earnings releases to the public markets, allowing a focus on the long-term success of customers and owners. Fidelity Bank, first known as the Bank of Fuquay, opened for business on August 10, 1909 in a one-room office in Fuquay Springs, North Carolina (now Fuquay-Varina). For the first six years a single associate, Eugene Howard, was responsible for helping the community with its banking needs. Mr. Howard knew all his customers by name and set a precedent of doing business the right way: with honesty, integrity, and a passion for service. During the 1920’s, another bank in North Carolina was following a similar path as the Bank of Fuquay. Firmly rooted in the community, the Bank of Biscoe was devoted to growing small businesses and providing a stable financial presence. 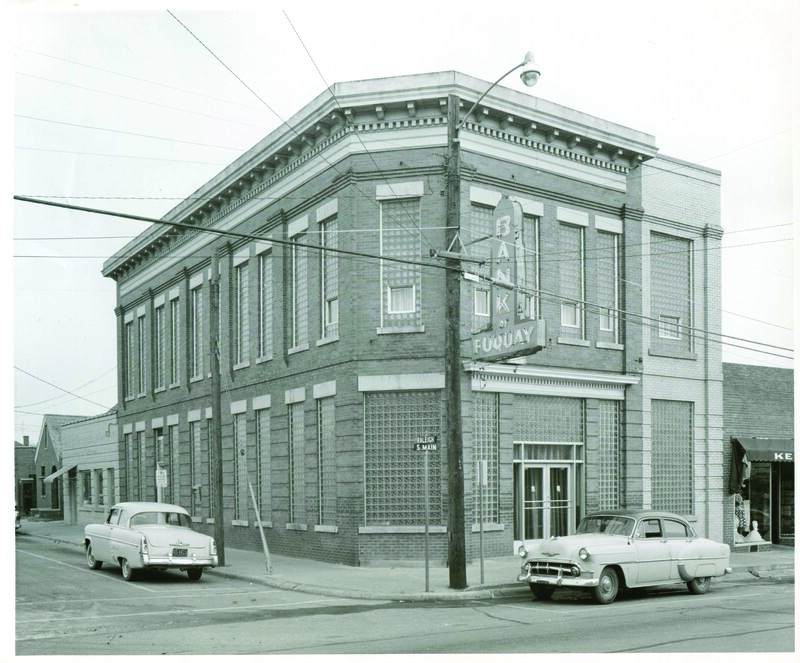 The Bank of Fuquay and the Bank of Biscoe remained strong during and after the Depression. Assets grew, and each bank began to open additional branches to serve neighboring towns. By 1970, the shareholders of the two banks voted to merge the institutions and renamed the corporation Fidelity Bank. Combining the resources of the two small banks allowed for automation of services, the increase of lending ability, and expansion into new communities. Fidelity Bank has remained strong through two World Wars, the Great Depression, the massive social changes of the twentieth century, and the local shifts from an agricultural to a technological economy. Since the beginning, the unique character of Fidelity Bank has been nurtured through conscious effort and leadership. Our foundation places a premium on trust that is based on the commitment to our customers, a century of solid banking service, and a tradition of sound financial principles. Today, Fidelity Bank serves 59 locations in 26 counties across North Carolina and Virginia and has approximately $1.6 billion in assets.